During a pre-taped episode of The Daily Show, Robert Pattinson didn’t shed any tears but that didn’t stop John Stewart from consoling him with some ice cream. Sources revealed that was the way the comedian decided to break the ice with Rob who made his first public interview set to air later tonight. Us Magazine reports John Stewart and Rob Pattinson shared a pint of Ben and Jerry’s ice cream while John joked, “Let’s talk about this, man-to-man.” But the Kristen Stewart questions didn’t get much further than that. Despite Stewart’s attempt to put his guest at ease, another witness says Pattinson was clearly anxious about being back in the spotlight. “Rob was just really awkward and acting kind of nervous,” the witness explains. Sweet, right? Why kick a man when he’s down? John Stewart seems like he handled the situation (and ice cream) with a little girl’s white gloves which is exactly what Rob needed. We all wondered if John would bring up the Kristen situation, and he did, but with respect and levity which was perfect. But this isn’t enough! I need to know more! We’ve got a little over an hour before it airs so be sure to check back in for the Live Recap for all the details! What do you think so far? Are you surprised John introduced the scandal so blatantly or did he have no choice? What do you make of Rob’s attempt at a joke? Did you heart twitch just the tiniest bit? I’m imagining him say the words and I can’t stop my face from grimacing. Poor dude! But good for him. 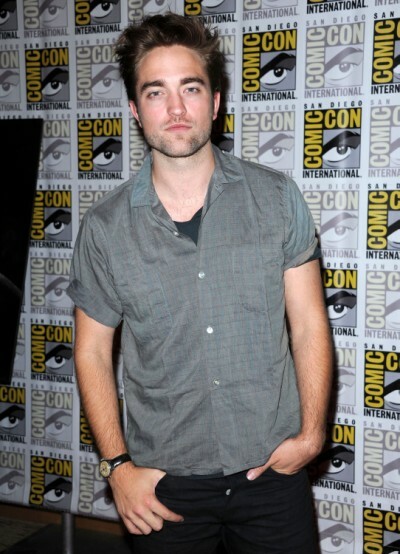 Again, I know she feels like sh-t and I don’t have to say it, but I will – damn you Kristen for doing this to him! I’m over the cheating. I think it pales in comparison to the media spotlight and unyielding curiosity. TMZ also said some of Rob’s fans booed him as he entered the studio because his limo pulled in without stopping. People are douches.